Does that window feel a little drafty? Is your electric bill higher than it should be? If you're living with old windows in your home, it may be time for an upgrade, and All American Glass can help. Call us today, and we'll schedule a free estimate on replacement windows in Friendswood. We've served the Friendswood area for over 10 years, and we're committed to helping our customers save on their energy costs. You'll be impressed with our selection of windows, designed to fit any budget or need. With All American Glass, you can be confident our energy efficient windows will lower your energy bill. If you're simply looking to replace broken glass, we do that too! Any glass project, we are your Friendswood window company. For a free estimate and consultation, call All American Glass today! 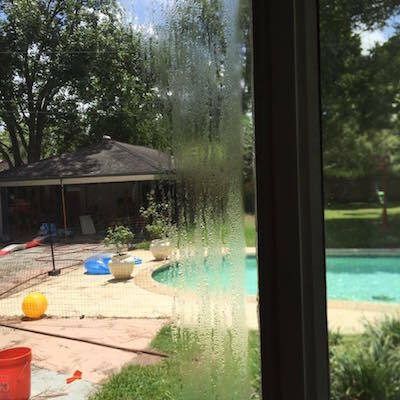 Do you have condensation between glass like this home in Friendswood? It's an indication of a broken thermal seal. We can take care of that for you.